I happened to stumble upon Venita Ozols-Graham’s debut 7 minute Horror short, titled “Used Body Parts” on Vimeo.com (streaming platform). Used Body Parts focuses on friends, Jenny and Scarlet (played by Brigitte Graham and Jordan Elizabeth respectively) who after stopping for gas in the middle of nowhere, end up in a fight for their lives when the owner (Tim DeZarn of “Fight Club” and “The Barber”) of the station reveals his disturbing operation. The film also stars Michael Villar (Carnage Park) *see review* https://adamthemoviegod.com/carnage-park-review/. Venita’s been working as an AD for well over 30 years, with her name attached to shows like “Star Trek”, “The X-Files”, “The Shield” and “Veronica Mars”. She’s now beginning to venture into writing and directing and it’s great to see someone from her TV background tackling Horror. Anyone who knows me knows I’m big on the dark horror content. Graham’s screenplay is built on the most basic of setups but it wears that familiar badge with pride. 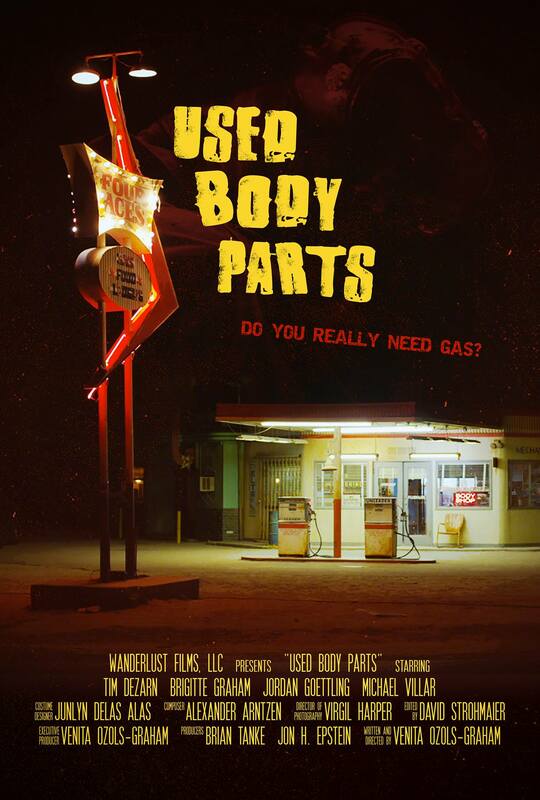 Those of you who enjoy a good gas station scene, and there’s been countless numbers of them (The Hills Have Eyes, Urban Legend, Cabin In The Woods or even Wild At Heart), will surely enjoy Used Body Parts. There’s a nifty introduction with the title credits appearing in the form of neon lights. Everything is nicely shot, well framed and smoothly edited and the audio track is loud and clear. Alexander Arntzen’s approach to the score is interesting as well, opting for high frequency sounds which are bound to jangle ones nerves, similar to that of the aforementioned “Hills Have Eyes” (06 version). The four performances are solid and the girls themselves are lovely. Fun fact, DeZarn (who reminds me of Lance Henriksen) also appeared in “Cabin In The Woods” in a very similar role (his agenda not far off as well). When the action hits it takes place in the blurred background of the shot, which I thought was a welcome change that worked extremely well. Fans of blood and gore will not be disappointed either. Graham utilizes practical effects and only some brief CG, also employing a great backdrop with which to showcase them. My only minor complaint was the creative decision to have Jenny convey her text messaging through self-dialogue, rather than just showing the viewer the conversation on the phone. People only tend to voice what they are writing if they’re telling someone about it but not if they’re on their own.